Syria’s President Bashar al-Assad has praised the role of Iran in his nation’s victories on the battlefield against Takfiri [extremist] terror groups, saying the Islamic Republic also deserves to be congratulated on these successes. Iran and all other states that sided with the Syrian nation are partners in the achievements made against terrorists, Assad said Wednesday in a meeting in Damascus with Chairman of the Iranian Parliament’s National Security and Foreign Policy Commission Alaeddin Boroujerdi. He said the Syrian nation should congratulate Iran on its latest gains against terrorists as they have come about with the Islamic Republic’s support. 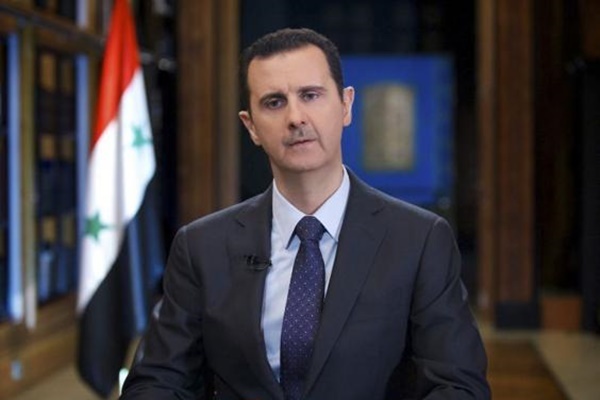 Assad thanked the Islamic Republic of Iran for its political and economic support for Syria that greatly helped the Syrian people in their resistance against terrorist groups, Tasnim reported. The Iranian parliamentarian, for his part, felicitated Damascus on the achievements in its anti-terror fight, notably the recent full liberation from Takfiri terrorists of the northwestern Syrian city of Aleppo. Iran has been offering military advisory support to the Syrian military, which has been battling foreign-backed militancy since 2011. The victory in Aleppo came in the face of the generous financial, military, ideological and political support provided by the Western states and their regional allies to the Takfiri militants pursuing Assad’s ouster. “Iran experienced the same circumstances in the days, which witnessed the liberation of Khorramshahr,” Boroujerdi added, as reported by Press TV. Iranian forces recaptured the southwestern city in April 1982 in a landmark operation code-named Beit ol-Moqaddas from Iraqi forces under the former dictator Saddam Hussein. The invaders were in their second year of waging a foreign-backed imposed war against the Islamic Republic. Iranian forces captured some 19,000 Iraqi troops during that operation. Some 6,000 Iraqi forces were also killed and thousands of others injured during the offensive. The Iranian delegation is to later meet with other senior Syrian officials, including the foreign minister, prime minister and parliament speaker.